Following the success of my microwaved flour as a substitute for cake flour, I was prompted by comments from fellow bloggers into thinking further about cornflour mixes. As ellaella suggested, a common method for making cake flour at home is to remove 2 tablespoons of bleached, plain (all purpose) flour per cup and to replace these with 2 tablespoons of cornflour (cornstarch). Would this still work if the plain flour was unbleached, however? And how would cakes made with a mix of plain flour and cornflour compare with cakes baked from microwaved flour? At about 5 o’clock this morning, I was struck by a further question. What would happen if I microwaved some flour first and then replaced 2 tablespoons per cup with 2 tablespoons of cornflour? Would the microwaving be enough to compensate for the lack of bleaching? Well, there was only one way to find out. Back to the kitchen I went. It just so happens that yesterday I made Rose’s Favorite Yellow Layer Cake using microwaved pasta flour in place of cake flour. It turned out beautifully. Could I really improve on this? I decided to bake two more of these butter cakes today. For the first, I microwaved 7 oz + a couple of spoonfuls of Doves Farm Organic speciality pasta flour for a total of 3 minutes on high (I have an ancient set of shop scales standing in my kitchen, so I tend to think and work in Imperial measurements). At this point, the whole experiment very nearly ended in disaster. I suddenly thought it would be easier to make up the cornflour mix if I had more microwaved flour on hand … so I popped a few more spoonfuls on a plate of their own into the microwave … and proceeded to burn the flour and melt a large hole in the bottom of the plastic plate. I guess microwaving such small amounts of flour isn’t such a good idea – be warned! Luckily, my kitchen was still relatively unburnt (despite the smell) andI had just sufficient microwaved flour to be able to prepare a cornflour mix nevertheless. I then used 7 oz of this microwaved-cornflour-mixed flour (which seemed a bit of a mouthful, so I was coming to regard this as ‘kate flour’ instead) to make my first cake. The flour mix for the second cake was more straightforward. I simply weighed the pasta flour straight from the bag and replaced 2 tablespoons per cup (spooned, 4.25 oz) with 2 tablespoons of cornflour. What happened? Well, just when things were looking good, they suddenly started looking even better! The cake made with ‘kate flour’ rose beautifully and behaved exactly as Rose said it would in The Cake Bible. The cake made with pasta flour+cornflour didn’t rise quite so high and then retired to below the rim on cooling. 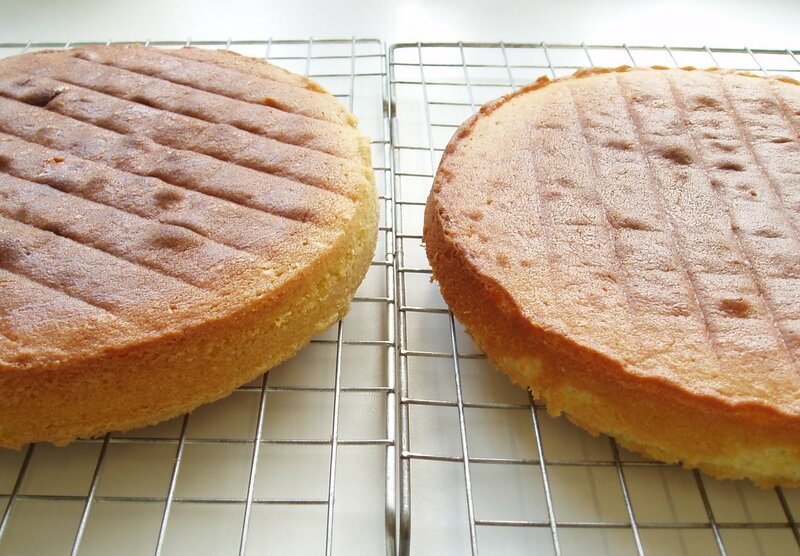 Inside, the ‘kate-flour’ cake (behind, on the right) had a finer texture and was lighter than either the pasta flour+cornflour (front) or all-microwaved-flour (behind, on the left) cakes. More importantly, the ‘kate-flour’ cake definitely got my vote for taste. The pasta flour+cornflour cake was simply stodgy and … well … floury. 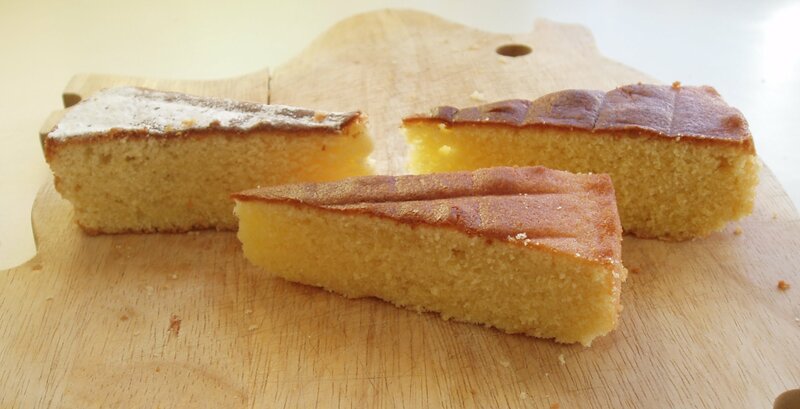 The ‘kate-flour’ cake, on the other hand, was moister than the all-microwaved-flour cake and had even more of a melting, soft feel in the mouth. Each bite brought a delicate flavour of vanilla and left behind a subtle, lingering tang. Perhaps with these new results, I might feel brave enough one day to use my ‘kate flour’ to bake another Golden Luxury Butter Cake … but that will be a story for another day. Kate, you have been working hard! I feel inspired to have a go myself and shall go shopping tomorrow for Dove’s pasta flour, I hope I can find it alright, I know I can find Dove’s but whether it will be pasta flour is questionable. I must admit baking these cakes is more a challenge to make them successful than baking from any of my other UK recipe books. I have Dorie Greenspan’s book as well so I would have more confidence to use those recipes if this flour mix works for me, fingers crossed! If you can’t get Dove’s pasta flour, then I think something like McDougall’s 00 grade flour (plain – I think it says something like ‘For sauces’ on its burgundy packet) would be better than Dove’s Plain White flour … look for something with less than 10g protein per 100g flour, anyway. Thanks, Kate, I’ve bought the Dove’s pasta flour today! I went to Oswestry, about 1o miles from where I live as there is an excellent shop there which I hoped would stock it and they had the full range! I also bought extra cornflour to make sure I don’t run out so I think I’m ready to start now,probably tomorrow morning will be when I actually get down to it. Will let you know the results. Hi Kate,Well, I’ve made my cake and I think it is a success, at least as far as the texture and the taste are concerned it is! My only concern is that it didn’t rise as well as I thought it should. I made the Perfectchoc. butter cake which you made but I used 2/3 of the recipe as Rose advises if your tins are 2inches deep, which mine are. I wondered if I had made it in an 8in. tin it would have had more depth and looked better. The centre of the cake measured one and a half ins. but the sides only 1in. I’ve just cut into it and it does taste very good, my husband commented on its lightness. I really wanted this to be a success as I hate buying books and then not using them, I must admit I have never been so nervous baking a cake before and I have done all my own baking all my married life, 47 years, including several wedding cakes!!!! I’m not giving up yet, I will try again with another recipe of Rose’s, they are a bit different and I would really like to succeed , it would be interesting to have her personal opinion on our efforts but I can’t see that happening! She was very excited about your findings on her blog this morning, I feel she is very appreciative and sympathetic of our efforts to make up her recipes, she seems like an old friend to me already! By the way , I burnt my first lot of flour by putting it on a plastic plate, I then put a second lot on a ceramic one and it was alright. You live and learn!! Oh, I’m so pleased you liked your cake! I’ve had butterflies in my stomach all day, wondering how you were getting on. Welcome to the plate-melters’ club 😉 (I used a plastic plate too – it was fine the first couple of times when I was microwaving a larger amount of flour, but reached meltdown when I tried microwaving only a couple of spoonfuls. I’ll use a ceramic plate next time, as well). Kate, There is a Flour mill in Shipton that sells flours via the post. I looked up some of their white flours. There is one listed under the white flours that is listed in the flours you can order via the post. It is No.117 and is listed as Soft Pastry and Cake Organic White Flour. It says it has lower protein levels naturally. I have written to them to ask what the gluten protein level is of this flour. I have passed your blog address to them. It would be lovely if they sent a bag of this flour for you to try out. I found the Shipton Mill Flours by accident. I am a keen bread baker too. I bought an excellent book recently by Richard Bertinent called Crust. I loved it. He has a kitchen school in Bath. I signed up for a day class in December! His technique is very different so am very excited to learn his ideas. He uses flour from this mill. There were some interesting flours too. I was very interested in the chestnut flour they sell to use in one of the Bertinet bread recipes. It was reassuring to me I wouldn’t have to traipse everywhere to try and find it in the shops. Hope the flour mill contacts you. Sorry, forgot to put the web address for Shipton Mill. I sound like I work for them…but I don’t. I just love having a good source publicized. Hello…me again. The Shipton Mill wrote back and said the gluten protein is 8.5% for the flour I wrote about earlier today. That is the closest to cake flour, which is 7.0-7.5% I believe. Thank you ever so much for all of this information, Melinda 🙂 The Shipton cake flour certainly does sound promising. Did they happen to mention whether or not it has been heat-treated? (I came across a cake flour by Carrs Flour Mills called Cheata. Apparently, it replaces their chlorinated cake flour and is heat-treated … but unavailable for personal use 😦 ). I can safely report that Carrs’ sauce flour probably does exactly what it says on the packet but doesn’t make cakes as well. However, I have just made the most wonderful Golden Luxury Butter Cake using Doves Farm pasta flour (with the kate-flour treatment). The ducks are really missing out on something special this time around! It’s very exciting to see how much difference the flour has made! Incidentally, Jeannette, I measured each layer and it was exactly as high as Rose says it should be. I did make the recipe precisely as written in TCB (US version), and my cake tins were exactly right. However, my yellow butter cake was slightly lower than expected, like your chocolate cake – although I’d put this down to the fact my springform tin is slightly larger than 9″ diameter. I didn’t measure my chocolate cake, so I don’t know about that one. I’m wondering if any generalised height differences could be more due to differences in baking powder rather than flour … but I’m not sure. Hello, I found your blog through Rose’s. I was wondering if you have tried microwaving plain and\or self raising uk flour for use in US reciepes that do not call for cake flour OR are you substituting ‘kate flour’ for the plain flour? I have made cakes several times in a row with a US reciepe that only calls for plain and self raising flour that came out horrible and dense. Before I understood about the flour differences I just assumed it was a poorly tested reciepe, so after reading your post about flour I wondered if the same might work for microwaving plain flour? I also am going to try the ‘kate flour’ method but cannot find the doves organic pasta flour. I do however have a ’00’ flour with a protein conten of 11 and I have a ‘sauce flour’ with a protein content of 9. Would the sauce flour work or should I try the ’00’ flour? Thank you so much for your experimentation I am sure it will help us all! By the way I am going to try to make the carrot cake that you have listed on this site, I am assuming it is using UK ingredients. As I was reading your reply to Jeanette I was wondering if the difference could be the baking powder too! But that is not so hard (or expensive to ship) to have sent over to England. I am sure that The Baker’s Catalogue has the one she uses. She uses a double action one and I think it is Rumford Baking Powder. I know that La Cuisuine in Alexandria, Va. has it. I’ve bought things from them and they are wonderful too. I said in my reply to Shipton to contact you on your blog. I wish they would collaborate with you on your project. Too bad about the Carr’s not being available. Typical. I have heard that there is an Italian cake flour that is unbleached. I haven’t found it anywhere yet though! Good luck. It is so exciting to find something that may work. Haven’t you started something here! LOL! It’s good to see there’s so much interest in baking US recipes, I thought I was a bit mad as there are so many UK baking books available, and I seem to have most of them!!! That’s what my husband would tell you anyway! I’m so glad your latest cake turned out so well, particularly as I bought 2 bags of the pasta flour because I was afraid it might not be there next time I wanted it. I wondered if the cake I made yesterday would have been better baked in an 8″ tin although I must admit I’m really pleased with the taste and texture of it as it is. Tonight I warmed it in the microwave and served it with some strawberries and cream, it was delicious, even my husband commented on it , he usually just eats what is put in front of him, he says he’s used to good food so doesn’t need to compliment me!!! Keep up the good work! Hi Jennifer – so far, I have only tried using the ‘kate flour’ for recipes that specifically call for cake flour. I haven’t tried microwaving self-raising flour in any way, largely because I haven’t needed to, but also because I couldn’t begin to be able to predict what effect microwaving would have on the raising agent. I can find the Doves Farm pasta flour in both of my local branches of Tesco (and I’m sure that’s not just because I happen to be buying it from them in industrial quantities!). If you have a Tesco nearby, you could try asking them about it. (And yes, my carrot cake recipe is UK-friendly 😉 ). Thanks for getting in touch, John – and also for the background info 🙂 . Do you know if any heat-treated flour is sold directly to the public in the UK, or is it (as seems to be the case) reserved solely for industrial use? I’m looking forward to hearing what you make of microwaved flour (+ cornflour?) – if it comes close to the flour obtained through industrial heat treatment processes, then that is certainly very good news for us home-bakers! john, i love what you wrote–especially the great pun on stone age technology! i’m wondering if you are related the the lister of listerine? a dear friend and former employer dr. maurice fitzgerald goodbody claimed him as a relative. i went through quite an ordeal revising the cake bible to a UK version with different blendings of plain and self raising flour to lower the leavening where needed. if only i had thought of heat treatment via the microwave! as flour is the foundation of baking this innoation of kate’s will have major impact and we are all overjoyed. Kate, I’m so pleased to see you getting recognition for all your patient work involved in your experiments with the flours and cake recipes. I know how busy you must be with your young family ,so good on you! Hello again, just to let you know I was looking on a site to purchase the Dove’s Farm pasta flour and I ran across the protein count per 100g and it stated it was 12 per 100g(3 higher than Kate tested with!). So I was wondering if anyone has purchased a bag that has this same protein count, and if using it in the microwave method, yeilded the same results? I am being forced to buy the flour from an online retailer due to the fact that my local Waitrose and 2 different Sainsburys have all the varieties of Dove’s Farm flours except the pasta flour! Should no one know what the results would be with this protein count I am going to try a different brand of flour and will let you all know how it goes(barring my 7month old allowing me the time!) ! Thanks for all your help…my husband thinks I am going flour crazy! If Kate were to contact me through the site I would love to send her a pack of our Soft Cake and Pastry Flour so she can see whether or not heat treating is required. And sepeaking of Carrot Cake, there is also a fantastic self raising very fine ground wholemeal available which makes just the best carrot cake in the world – which ever side of the pond you are on!! Oh, thank you! That is very kind of you, Tom. I’ll pop over to your site and get in touch with you. It’s wonderful to see the interest that my kitchen-experiments have generated, and I appreciate your involvement greatly. Jennifer, do you remember which site gave the protein content as 12% for the Dove’s pasta flour? (btw, my youngest is 6 months old, and my husband also thinks I’ve gone flour crazy!). The site is Goodness Direct, the address is http://www.goodnessdirect.co.uk or you can link directly to them from the Dove’s Farm site stockist page. My son is the reason I started baking so much…I’ve been looking for the perfect birthday cake, so far nothing has come out on top….since this ‘flour revolution’ I might just re-try some reciepes! Another question, not of flour! I am from the states and I found a terrific reciepe for a pumpkin spice cake but cannot find canned pumpkin anywhere have you run across it? (Might just have to stew it myself, I had to learn to make my sweet potato pie from scratch…used canned sweet potoato) I will be going to the states for thanksgiving, would you like me to send you some real cake flour to compare? It’s the least I can do to thank you for your inventivness! Jennifer, I buy my tinned Libby’s pumpkin from Waitrose in Henley on Thames store. I’ve noticed that not all of the Waitrose stores carry it. Enjoy your visit for Thanksgiving. I’m from Oregon originally, and transplanted here circa 1978…But i still have to have that pumpkin! Kate, I wanted to ask if you needed or wanted a second cake tester? I don’t want to interfere, (more thanI already have) in your wonderful discovery. But if it helps, I would gladly bake and test recipes for the cause. I work in the hospital. My colleagues are like undiscerning ducks…they will eat anything. So I don’t have to eat it all myself. Those Shipton Miller boys sound nice! I’d really love to be able to make some cakes with cake flour just to see what the ‘real thing’ is like, but I’m not terribly clear about the limits of the importing regulations …?? I certainly don’t want to get anyone into trouble! But oh, I’m sooo tempted by your kind offer 🙂 .